Broadly speaking, there are two types of people who need a portable hard drive. One type just needs a little additional storage periodically and would rather have something flexible and portable than a big honking drive that plugs into the wall. The other is the high-falutin’ “professional on the go” who is taking pictures, recording video, and producing tremendous amounts of data while travelling, so they carry a hard drive with them every single day. 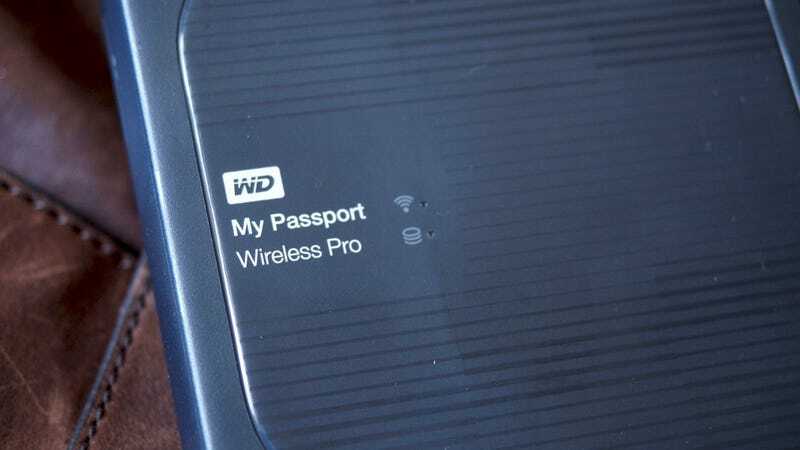 While the former has their pick of any of the drives available when you search “portable hard drive” on Amazon, the latter might prefer something a little more robust, like Western Digital’s new My Passport Wireless Pro. The new My Passport portable hard drive, available in 2TB (£190) and 3TB (£210) versions, might be one of the most flexible computer accessories you can buy. That’s because it’s not just a hard drive but also a 6,400 mAh portable battery, an SD card, USB reader, and an AC wireless router. That steep price tag (more than double a regular 2TB external drive) is starting to look a little more appealing isn’t it? It’s designed to work with Mac and Windows (ExFAT formatted), and if you plug it in via USB it will work just like any other old hard drive. All those additional, and very appealing, features require at least one visit to the MyCloud app on iOS and Android. That’s where you go to customise the router, connect it to other wireless access points, tell the hard drive what to do when it sees new media, and change the name of the device. I used the hard drive for over two weeks, first as a regular hard drive plugged into my work computer, then as a router connected to a MacBook. That’s when I discovered that copying giant files from one computer to another, while browsing the internet and ripping data off SD cards is a sure fire way to take the laptop’s battery from 20 per cent to zero in under forty minutes. Finally I gave the My Passport Wireless Pro its biggest test: I took it with me for a long weekend of photography and left the computer at home. It was just me, the hard drive, and an iPad. It’s incredibly handy as a hard drive, and the ability to automatically copy any SD card inserted into its reader is a massive convenience, especially when you’re operating devices like an iPad that don’t have SD card readers built in. But I was also terrified every time I used the feature. There’s no easy way to tell when it’s finished copying without logging into the My Cloud app. So my obsessive paranoia about losing all my photos was not abated. My Passport Wireless Pro is also lacking a crucial feature for many photographers: a CompactFlash reader. Sure, SD cards are incredibly popular – I use them in both my primary and back up cameras – but the cameras most professional photographers don’t use SD cards. They use CompactFlash, so Western Digital’s omitting a CF readers feels pretty glaring. Western Digital does provide a way around this omission by including a USB 2.0 port. You could, theoretically, use a USB to CF adapter, but that means one more obnoxious dongle to carry around in your bag. The other issue photographers might face is the lack of RAW support in the iOS app. For the most part using the My Cloud app is easy. While I was carrying nothing in my bag but my iPad, mirrorless camera, and the Wireless Pro, I had no issues taking pictures, popping them in the SD card reader, and then editing them in Pixelmator. But one day I opted to only shoot in RAW, with no JPEG back-ups. When I went to browse the photos, I was met with a series of question marks and forced to open each photo individually in another app. Yet it wasn’t exactly nightmarish. Nothing about the My Passport Wireless Pro is nightmarish — though the grey plastic shell certainly screams “my dad’s IBM circa 1994”. The device is extraordinary simply, because it can do so much in such a small box. If you just want a hard drive, there are plenty to choose from. 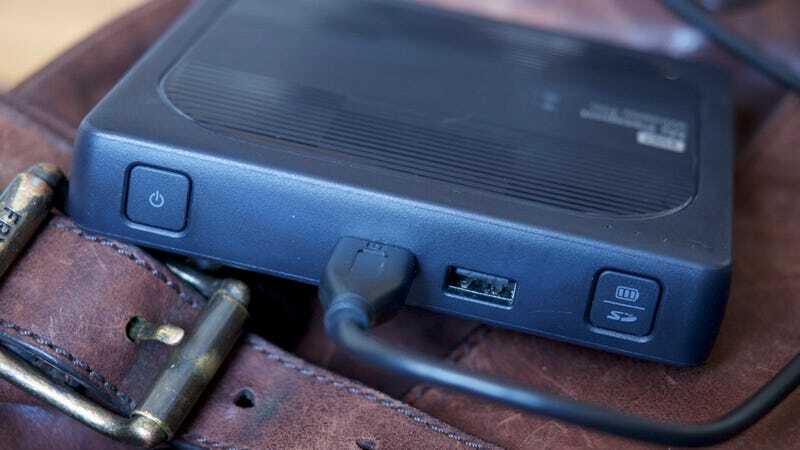 But if you’re looking for a better blend of convenience and functionality then it’s time to toss the Western Digital My Passport Wireless Pro into your everyday bag.